Oesterlars Round Church. Bornholm. Denmark. Oesterlars Rundkirke (Oesterlars Round Church). Bornholm. Denmark. oesterlars Round Church is the oldest and largest of its kind in Denmark. The church was built around 1150 AC. It consist of a round nave of 17 meter in diameter. The nave is built around a midt pillar with 6 arcades. 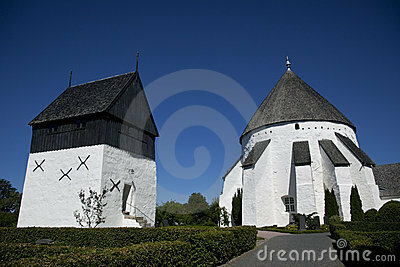 Oesterlars church is one of the most important tourist attraction on Bornholm.